People who have vertigo are more likely to have bone loss. Calcium is one of the important minerals needed for bones to form. At the same time, taking calcium is one of the best natural remedies for vertigo as it helps clear the crystals out of the inner ear. Vertigo and osteoporosis have an unexpected link, research shows. People who have vertigo—the feeling of dizziness, spinning or falling even when the body is at rest—are more likely to have bone loss, according to a study published in the medical journal, Neurology. Conversely, people with osteoporosis, or low bone density, were three times more likely to have vertigo. And, those with osteopenia (or pre-osteoporosis) were twice as likely to have vertigo as people who had normal bone density. The association was most pronounced in women—nearly 75% of those with a diagnosis of vertigo had osteopenia or osteoporosis compared with only about 43% of patients who did not experience dizziness. While vertigo can be triggered by a number of underlying issues (inflammation or fluctuating pressure in the inner ear, Meniere’s disease, etc.) one major cause is loose calcium carbonate crystals moving through the sensing tubes of the inner ear. The inner ear governs sense of balance. Both vertigo and osteoporosis occur more often in post-menopausal women because the drop in estrogen that accompanies menopause causes bones to release more calcium into the blood. And, the increase in “free” calcium also prevents the body from clearing the crystals out of the inner ear as it normally would. “Women most often have their first case of vertigo in their 50s, when they are also having a drop in bone mass due to loss of estrogen,” says study author Ji Soo Kim, MD, PhD, of Seoul National University College of Medicine in Korea. While it is well documented that supplementing with calcium slows the rate of bone loss in post-menopausal women, Dr. Kim also noted that the link between estrogen, bone loss and vertigo is somewhat incomplete since men with vertigo were also more likely to have thinning bones. The bottom line is that while women with menopause definitely benefit from calcium supplementation, men and women of all ages should regularly consume calcium. In fact, many doctors advise getting an adequate amount of calcium beginning in childhood to fight bone disease. Simply put, calcium is one of the important minerals needed for bones to form. If you do not get enough calcium, or your body does not absorb enough calcium from your diet, your bones will become brittle and are more likely to fracture. At the same time, taking calcium is one of the best natural remedies for vertigo as it helps clear the crystals out of the inner ear. School-aged children (ages 4 to 8) require 1,000 mg of calcium per day. As children reach puberty (9 to 18), calcium requirements increase to 1,300 mg per day. During adulthood (ages 19 to 50), calcium requirements drop back to 1000 mg per day. And after 50, adults require about 1,200 mg of calcium per day. Take your daily calcium supplement in divided doses; that is, with a meal and spread out over at least two meals. Clinical studies have shown that the body can only absorb 500 mg of calcium at a time, so to take your full 1000 mg dose at one time would be throwing your money down the drain. Calcium supplements come in several forms—calcium carbonate, fumarate, malate, succinate, aspartate, or citrate. 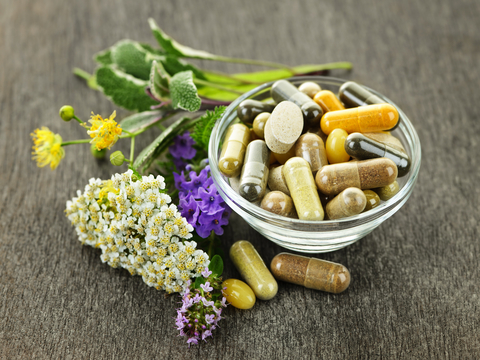 Some forms of the supplement are better absorbed and have virtually no toxicity. So, which calcium supplement should you choose? Which provides the best absorption? And, which is the most cost effective? Don’t forget that calcium is not the only nutrient necessary to promote healthy bones, and it may not even be the most important one. In fact, calcium by itself does little good because it is not as readily absorbed by the body without taking magnesium and vitamin D. Furthermore, eating or supplementing too much calcium in the absence of other nutrients can actually lead to osteoporosis and cause dizziness as well as other serious problems such as kidney stones, plaque in your arteries or painful calcium deposits manifested as gout or arthritis. Therefore, calcium should always be teamed with two other bone health nutrients: vitamin D and magnesium. Vitamin D facilitates the absorption of calcium from food. Therefore, without an adequate intake of vitamin D, the body cannot form enough of the hormone calcitriol to adequately absorb calcium. Without calcitriol, the body “steals” calcium from the bones, including the bones of the inner ear. That’s why people who suffer from vitamin D deficiency often suffer from a variety of symptoms including weak bones (osteopenia and osteoporosis), gum disease, brittle nails, tinnitus (ringing in the ear), and dizziness (vertigo). Additionally, taking vitamin D helps reduce the risk of fractures. Since deficiencies in vitamin D lead to weak bones and dizziness, people with the deficiency are more likely to suffer falls resulting in painful fractures. A study examining the effects of vitamin D3 combined with calcium supplementation in elderly women found that vitamin D3 supplementation helped to reduce overall age-related bone loss as well as the risk of fractures due to fewer episodes of falling. Magnesium is necessary for more than 300 biochemical reactions in the body, including helping with muscle relaxation and nerve conduction, steadying heart rhythm, supporting the immune system, and keeping bones strong. Magnesium is also a mineral necessary for electrolyte balance within the body. If you lack an adequate amount of magnesium, your brain may not receive messages from your sensory nerves as it should. Additionally, the brain may interpret messages from the inner ear that movement and gravity are felt, even when there is no movement at all. This results in dizzy spells and loss of balance. Low Magnesium Symptoms: Are These a Clue to the Cause of Your Health Problem? Research clearly confirms that calcium, magnesium and vitamin D are remarkable natural remedies for vertigo, and they the cornerstones for any good osteoporosis fighting program. But, there is one Chinese herb that also ranks among the top natural remedies for vertigo and the osteoporosis natural remedies: Ginkgo biloba. Read about this amazing herbal treatment here. If you have symptoms of either vertigo or osteoporosis, start implementing these simple strategies. Test for vitamin D deficiency and supplement if needed. Be sure to tell us about your experience in the comments section below. Neurology March 24, 2009 vol. 72 no. 12 1069-1076.
arthritis, bone, bone density, bone disease, bone health, bone loss, bone mass, bones strong, brain, calcium, calcium from food, children, diet, dizziness, dizzy, estrogen, food, ginkgo biloba, gout, gout or arthritis, health, healthy bones, hormone, immune system, inflammation, inner ear, kidney stones, low bone density, low magnesium, low magnesium symptoms, magnesium, menopausal, muscle, natural remedies, natural remedies for, natural remedies for vertigo, normal bone density, nutrients, nuts, osteopenia, osteopenia and osteoporosis, osteoporosis, osteoporosis natural remedies, pre osteoporosis, ringing in the ear, spinach, supplement, supplements, symptoms low magnesium, tinnitus, vegetables, vertigo, vitamin, vitamin d, vitamin d deficiency, vitamin d3, weak bones, your bones. You did not mention Vitamin K? Amazing! I have osteoporosis, and have had frequent vertigo episodes since I was a child. However the frequency and severity of the vertigo have lessened since I’ve been taking calcium. My mother had severe osteoporosis – and frequent vertigo episodes her whole life. Thank you – great website!! The worst thing you can do is take calciium as a lone remedy. You need to address calcium metabolism. The only form of calcium to use is MCHA calcium but chances are you don’t need calcium and that it will cause more calcification. Here are nutrients you need to know. Fat Soluble D3. Taking D3 only will cause calcification. Vitamin K2 in both forms MK4 and MK7. Research has only shown MK4 to be effective. Bioavailable Silica. High quality fracture proof bones are made of bone and collagen. Boron is important for Parathyroid gland. I use Borax because it absorbs well. There are other cofactors like manganese. In Japan and Netherland, they use high dose K2 MK4 (15mg 3Xday) to cure osteoporosis. Using only calcium will likely make you die quicker. You need to use cofactors also. Forgot to mention magnesium. Magtein is best for me. There are many magnesium supplement, i think calcium to magnesoim ratio should be 1 to 1. I went to a ayurvedic practitioner and I got a bottle of vile tasting stuff, could not stomach it. Do they distills? She said no!